Whar does the EKF indicator on the HUD mean when Yellow or Red? In recent flight tests I noticed that when coming home and yawing in RTL mode, the EKF indicator on the bottom center of the HUD turns yellow or red, then returns to normal after the quadcopter stops turning. 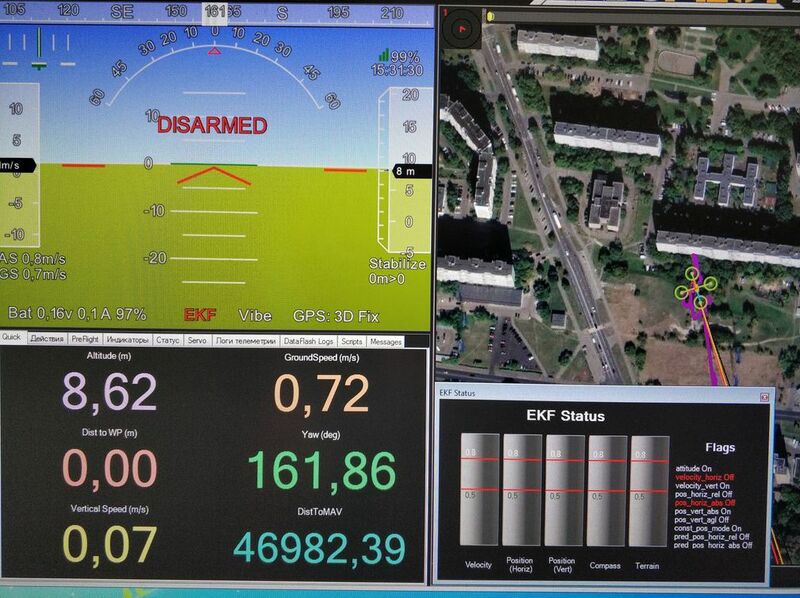 I’m using the new Emlid Navio2 release with Arducopter 3.4.6. Click on the EKF and the status bars will open up. Check what it actually is. I’m thinking mag. Thanks for the tips folks. What is compass interference, and why is it temporary? Could you show us a picture of your setup? Mag interference be from you electrical system or a bad calibration. Try the onboard calibration instead of MP version. If you get a good calibration and still having trouble, run a Compass MOT. Just scroll down in the previous link to find out how if you’ve never done one before. I have not yet completed compass calibration on a new system I have currently on the bench. When I click on “EKF” on the HUD, the EKF Status graph comes up, as depicted in X1Aero’s post. However the graph is not live. I also see all EKF flags are zero. I have searched the parameters list in MP, and the documentation, and can’t find a way to bring this graph to life. What am I missing? Where are these settings in MP? click the ekf text on the hud to get the screen. MP config screen>Full Parameter List ? What commands (lines), values should I pay attention to?